or even create something special and put it up in a frame somewhere. is easier to get through it knowing you have family by your side. outside edge just to give it a little more sparkle. a very special family member that you have. Good Morning! Debbie with you this today to share a care in honor of Breast Cancer Month. It's always hard to find the right words to say to a friend who has gone through or going through treatment for this awful disease. What do you say??? It's not an easy journey. I have been surrounded by Breast Cancer. My Mother is a Survivor of 5 years. My best friend of 35 years passed away within 6 months of being diagnosed. I had an aunt pass away years ago, when they had no treatments at all....she was only 46. It's simply one of those things that you just never know who will be next. I created this card to give to a friend, it can be used for any occasion but I thought I'd do it in pink in honor of all Breast Cancer Survivors. 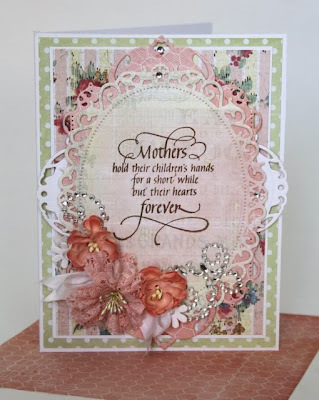 I used this beautiful stamp by Quietfire Design, you can find it in the store here. Thanks for stopping by the Quietfire Creations blog today! Both cards start of with a side folded 5.5" x 4.25" white cardstock. I taped off a 1/2" border all around (ps if you're doing multiples, just make yourself a stencil for the border from thin cardstock or clear plastic). 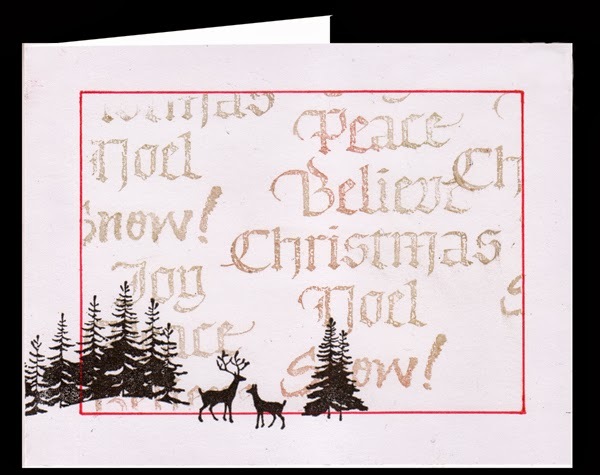 Stamped the Textured Holiday Word stamp repeatedly using Versamark (can use Perfect Medium or Distress Emboss pad as well). While the ink was wet, dusted on Perfect Pearls (Perfect Gold, Rust, Forever Green). Wiped off the excess with a dry paper towel. Removed my tape and drew a border around my stamping. Red Zig marker on one and a Faber Castell Artist Pen "Copper " for the other. On the first card I stamped the tree/deer image (Memory Box) with Versafine Black Onyx. 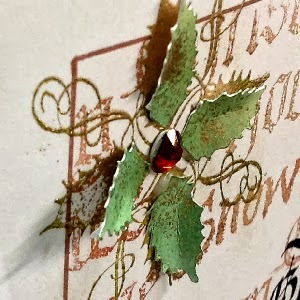 On the card at right I stamped the Holly leaf flourish with Versafine "Spanish Moss" and embossed with "Queen's Gold" and some "Olive Leaf" embossing powder. To create the raised leaves, I stamped them again in black, scanned them, and cut with my electronic cutter, then applied some of the Moss and embossed with the same powders. (PS if you don't have an electronic cutter, you could just hand cut them. I adhered them to the card so the leaves were raised, (see detail pic below) and added a large red rhinestone. The sentiment was stamped with the Black and clear embossed. Hope you give it a try if you're looking for something quick and easy. The Perfect Pearls give such a nice background. And now for a change of pace from a lady who really knows how to have fun! 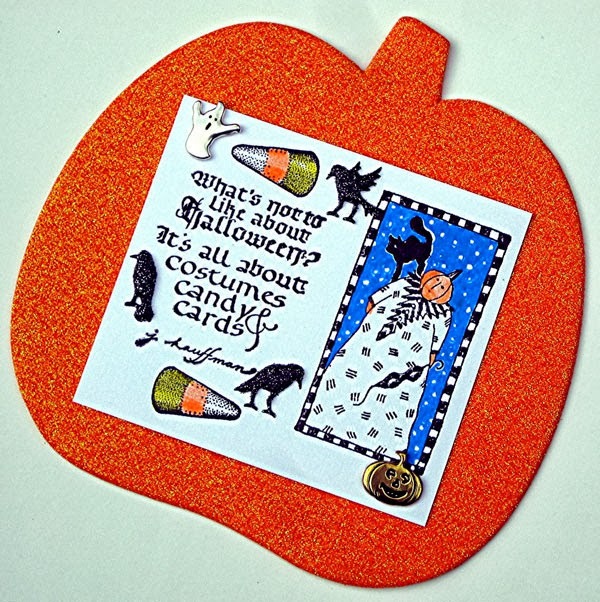 Judi Kauffman shared a Halloween card that combines the Quietfire Design stamp with her quote on it and two vintage stamps from her collection (candy corn = Rubber Stamps of America, pumpkin lady = Rubbermoon). She mixed in a glittery foam pumpkin, pumpkin and ghost brads, and glittered crow stickers. Her theory: Halloween is not a time for minimalism! Make substitutions to create your own version, using any other stamps, stickers, and embellishments that coordinate with the quote. Hand cut a simple pumpkin from glittered or plain old orange cardstock. Thanks Judi! You always make me smile at Halloween! Here is the second creation by our guest designer Martine Smith! You may see the first project here. Martine made a circle, cut up the Branching Out Spellbinders die set (as she did in her first project for us) and added some leaves and berries to form a wreath. She then added a bow with a poinsettia . 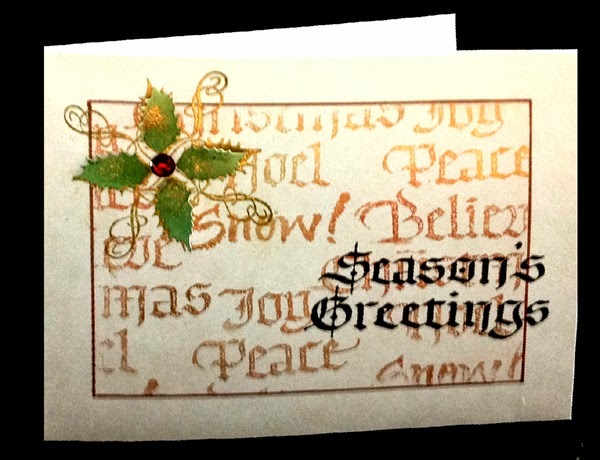 She stamped the image and put the wreath over the stamp. The berries and leaves are from her personal stash. The Poinsettia and Crochet Corner are from Memory Box. Some of the other items are shown below in the thumbnail links. For more directions, we'll just have to all go visit Martine! In the meantime you may find her on her blog here! Thanks for sharing your beautiful work Martine! We really love your creations! Good morning! 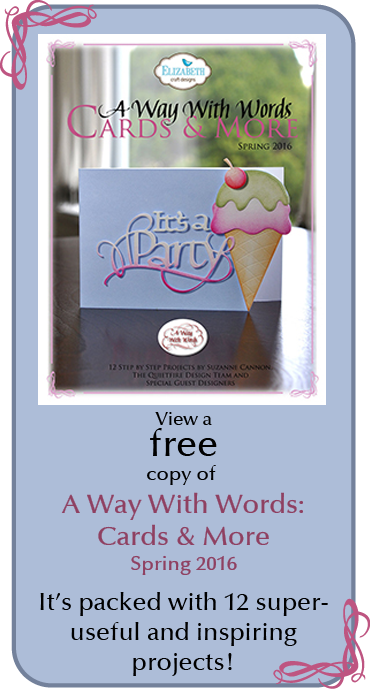 Sherry here today and I have a quick and easy card to share using the new set To Give Thanks. I had the idea for the image before I started anything else with the card. The background pumpkin was stamped in VersaMark, sprinkled with copper embossing powder and then the embossing powder was rubbed off. (I actually came up with rubbing the embossing powder off after a few trial and errors while trying to get this image to work.) The pumpkin and leaves were water colored with markers and the excess water was dabbed off to create a softer look. “Happy Thanksgiving” was then stamped over the image and embossed in copper. The sentiment was then die cut/embossed with Spellbinders Small Ovals and while still in the die, was sponged with Antique Linen. Coordinating paper was die cut/embossed with the Large and Scalloped Ovals. I pulled out some old KaiserCraft paper from my stash that I thought would go with Thanksgiving and used it for the card. The edges were distress and then inked with Antique Linen Distress Ink. The ribbon was dyed with Bundled Sage Distress Stain. The bottom border for the card was die cut with Spellbinders Scalloped Borders Two. That’s all for me today! Thanks for joining me. Tsukineko Embossing Powder, Copper, 1 oz. Hi Everyone! This is Holly with a sweet and simple Thank You card. I began by selecting four print papers from PRIMA-Melody 6x6 Paper Pad, and one matching plain paper for the base layer. Once I decided on the order of the papers, I cut 4 at 1 1/4", 4 at 1 1/2" and 4 at 1 3/4". The finished card is 4 1/4" x 5 1/2". Two opposite corners on each piece were rounded with a corner rounder punch. The base piece was adhered to the card base, then all the pieces were sponged around the edges using ARCHIVAL INK in sepia colour. I applied a foam tape square to one tip and adhesive to the other. The foam tips were all placed to the outside and the adhesive tips were pressed down flat in the center of the layout. The THANKS stamp was inked with ARCHIVAL INK in jet black. I added some flat-back black beads from my stash, to finish the card. I didn't time it, but it was a nice, quick card. The longest time was spent choosing the paper because so many beautiful choices are available. Hello Everyone, Terre Fry here with a card from one of my favorite season's....FALL! 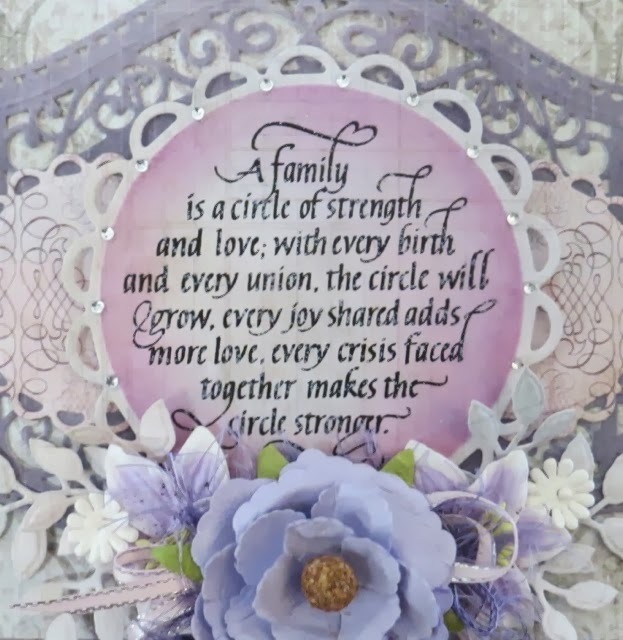 There are so many things in my life that I am thankful for and I just love this sentiment from Quietfire Design new release "To Give Thanks". For this card I used a few of my favorites, Spellbinders Diamond Effects Card Creator die template, Botanical Swirls and Accents die template, Want2Scraps Swirls Finesse Brown Rhinestones, Tsukineko Memento Tuxedo Black ink, Beacon Adhesives Zip Dry and Copic Markers. Isn't that sentiment just great? 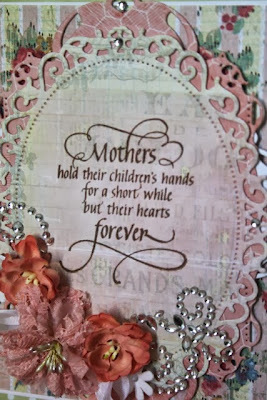 I just love creating with Quietfire Design sentiment, they just say it all. Hi everyone and happy Monday to all of you! special Moms in our lives. Mom did for me and also what a truly special person she is. so I created this card with this beautiful sentiment to give to my mom. 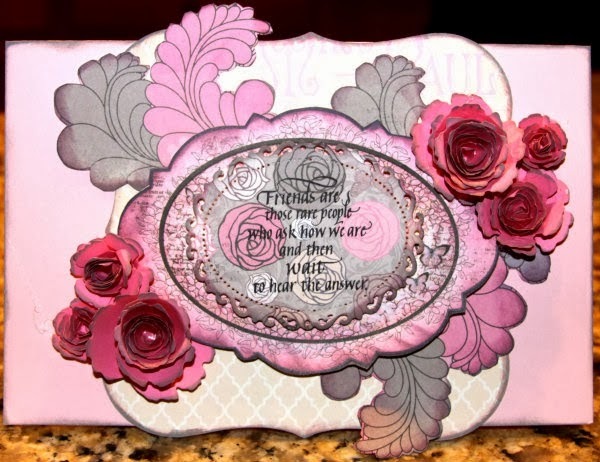 paper by Prima and white to create the back round. I stamped the sentiment in dark brown ink on Floral Ovals. anytime of the year... just because. stopping in to see what's new on the Quietfire blog today. October is a month that we dedicate to all the Breast Cancer Survivors and the loved ones we have lost to this awful disease. Today my blog post is dedicated to these people and to one special lady I had in my life for 35 years and then she was gone. She left her footprints on my heart. She was my best friend from the minute we met until the minute she passed. Her name was Val and Breast Cancer took her too soon. I was going to create a card but then I decided to do a page in my Art Journal in her memory. 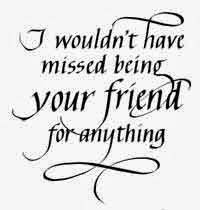 The stamp I used says "I wouldn't have missed being your friend for Anything". 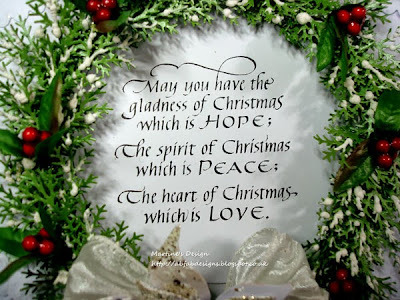 It is the perfect sentiment! You can buy the stamp here. Yogi here today and I'm using the technique Holly showed us a couple days ago "faux cross stitch" (with a couple variations/additions of course...) and using one of Suzanne's newest e-cut files from the Silhouette store and a Halloween stamp. I side folded my white card, lay down a Crafter's Workshop 6 x 6 stencil "Window Screen" (my lines are at an angle rather than straight up and down) and then lay down the " 3 cats" Dreamweaver stencil (LM266). Temporarily taped them down. Stippled Color Box on the cats in various colors of browns, removed my stencils and clear embossed. Another variation - put the stencils back in place and applied Distress Black Soot, wiped the excess of the cats and removed the cat stencil, keeping the screen in place. Pounced some petal point chalk pads in two shades of blue. Removed the screen stencil. Outlined the design with a black Zig Writer. 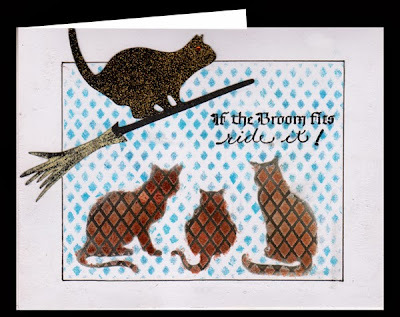 Electronically cut the cat on broom from black cardstock. Applied Versamark on the broom section and embossed with Distress "Antique Linen" embossing powder. Applied Versamark on the cat and embossed with one of my dirty mixes of black and gold embossing powder. Added a small amber rhinestone for his eye and adhered to card. Stamped the quote with Versafine Black Onyx and clear embossed. Hope you give it a try, it is fun. Today I'd like to introduce you to Martine Smith, our October Guest Designer. Martine resides in Rochester, Kent in the UK and I think we can all guess that she's been crafting most of her life. Martine trained in floristry, but has been known to work in a chemist's shop (pharmacy to us North Americans). About 4-1/2 years ago Tracey of Oyster Stamps asked if she'd like a job, and the rest is history. Martine is now the Manager and does craft shows all over the country. She is married with one daughter and has a beautiful Rottweiler named Tiffany. 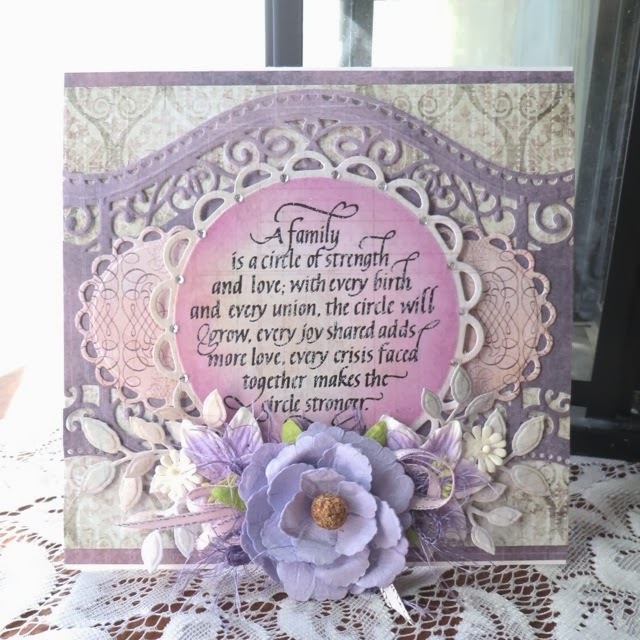 Here is the first of two beautiful cards Martine is sharing with us. I think you'll agree, there is something special about Martine's creations! Martine tells us that the background can be scored on a Score Board of your choice by making a diamond pattern and then adding Liquid Pearls at the intersections. 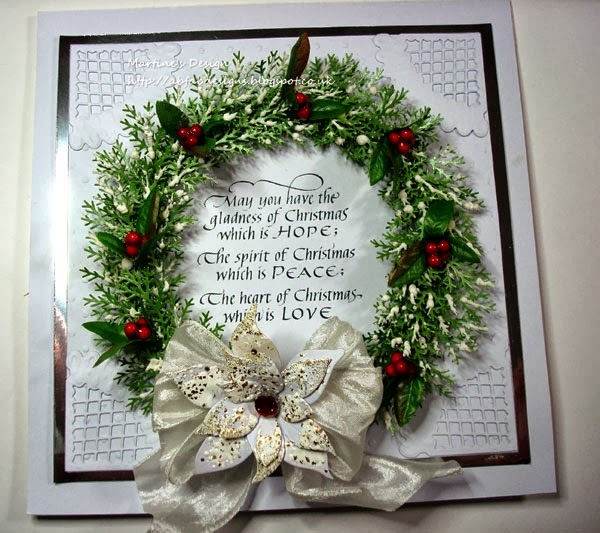 The poinsettia is the Blooming Poinsettia from Memory Box and the petals and candles are highlighted with Stickles. The branches are all cut out from Spellbinders' Branching Out dies. Other items used have thumbnail links (below) to the Quietfire website. Make sure you follow her! You won't be disappointed. Good morning! Sherry here today with a fun and wicked Halloween card. I’ve had this card in my mind for some months now and finally ordered the Crows so that I could get it completed. You’ll need to envision that the crow is actually a raven however, because that was the inspiration for my card . . . Edgar Allan Poe’s The Raven. The poem was printed out on cardstock, then inked using the Wrinkle-Free Distress Technique, using Gathered Twigs, Dusty Concord and Wild Honey Distress Inks. The edges were distressed and sponged with Gathered Twigs. The raven and the sentiment, Something Wicked this Way Comes, from the Halloween Wicked Collection were both stamped on paper that had also been colored using the same technique and colors and above. Both were stamped in black. The sentiment was trimmed out and distressed. The raven was die cut/embossed with Spellbinders Circles, layering in size, ending with the Scalloped Circles. Black cardstock was used for the base of the card and purple for a second layer. “Tapping” from the Crow stamp set was stamped in white pigment across the purple paper to add some extra dimension. A piece of Graphic 45 Olde Curiosity Shoppe paper was trimmed and sewn to the purple layer. The ribbon was dyed with Dusty Concord Distress Ink. That’s all for me today. Thanks for joining me.